1. Arrive early for the closest parking space. 3. Sunscreen, sunblock and lip balm for sun protection. 4. Comfortable beach chair with shoulder strap and cup holder. 5. Beach bag, lined to keep out sand and side pockets for phone. 6. 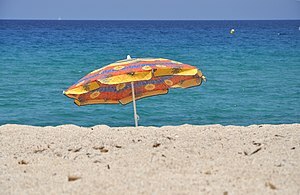 Beach umbrella, in case of rain, leaving is not an option. 7. Comfortable ear buds for your favorite playlist. 6. A great summer read and a favorite magazine. 7. 2 beach towels, 1 for sunbathing, the other to dry off after swimming. 8. A six pack ice cooler with water and your favorite snacks. 9. Small bag of bread crumbs to feed the seagulls. 10. Scribble a message in the sand near your chair, just for fun. 11. Takes lots of photos to share with friends. 12. Stay as long as you can.